The 2018 Honda Accord is 29 percent ultra-high-strength steel, the company announced Friday — the highest proportion of the 780-megapascal-and-up grades in any mass-market Honda car. This lightweighting of the No. 9 vehicle in America (according to GoodCarBadCar’s tallies) is yet another reminder that a modern collision repairer simply can’t expect to fix cars the same way they used to — and likely not with the same equipment either. Honda said more than half of the 2018 Accord — 54.2 percent — was “high strength steel (above 440 MPa).” Other next-generation Hondas jump from 440-megapascal steel to 590 MPa steel, the threshold for “advanced high-strength steel,” and we’d expect the Accord to do so as well. “Underneath the skin is a more rigid and lightweight body with our highest ever application of ultra-high strength steel, plus a new aluminum-intensive chassis with available Adaptive Dampers,” American Honda Honda Automobile Division Senior Vice President Jeff Conrad said Friday, according to Honda. Cross into 590 MPa, and repair procedures start dramatically changing on Hondas. Parts become replace-only, unsectionable except in certain areas, and increasingly unable to tolerate heat. 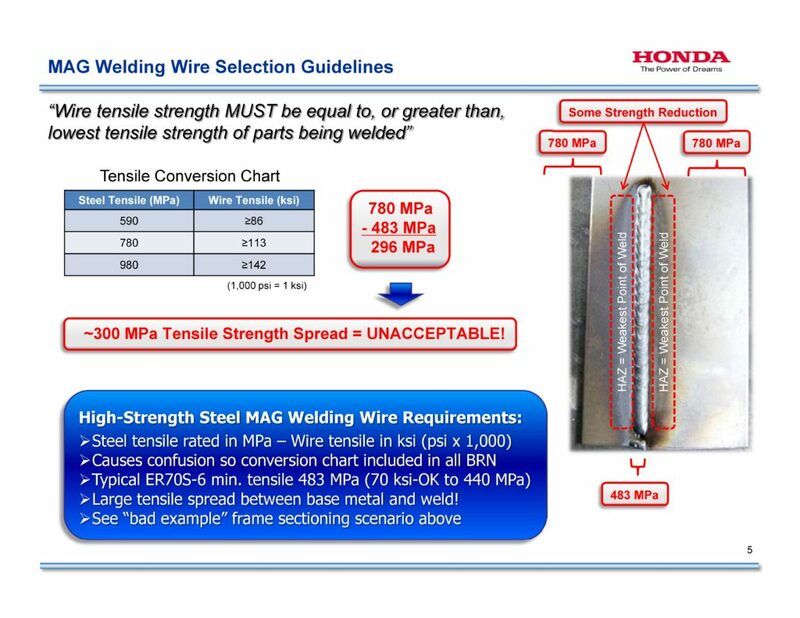 Welding faces greater restrictions, and starting at 590 MPa steel, Honda also demands increasingly stronger MAG welding wire than the standard ER70S-6 shops have been using for years. The wire must be equal in tensile strength or greater than the weakest metal being welded. The OEM also recommends using solely 980 MPa welding wire for all of those steel grades, all the way down to the 270 MPa mild steel. That way, shops can avoid a costly — or life-threatening — mistake caused by swapping between different wire strengths, according to a Honda expert. The car itself weighs 110-176 pounds less than the 2017 Accord, the last model of the sedan’s ninth generation. The light, strong metals and “extensive use of structural adhesives” — a first for the Accord, Honda said — have increased torsional rigidity 32 percent and bending rigidity 24 percent, according to Honda. 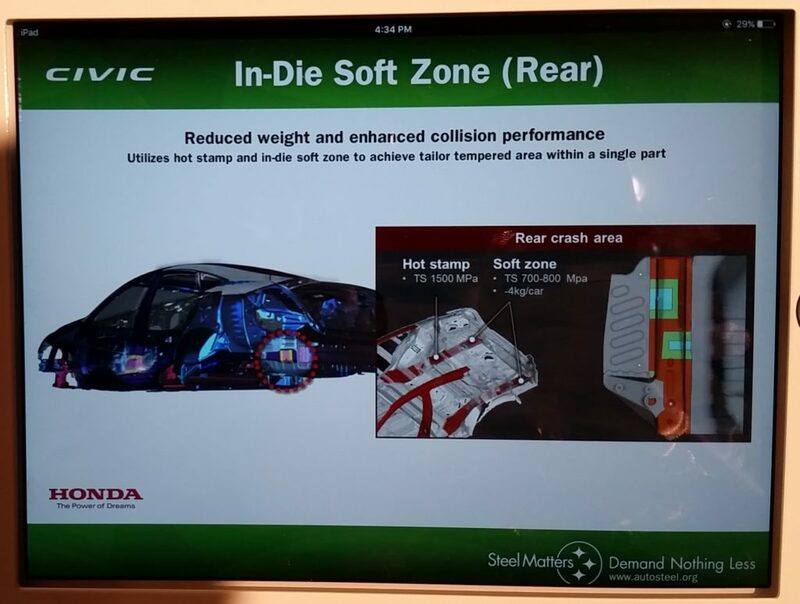 Honda also describes “tailor-tempered rear frame members for improved crash-energy absorption,” which sounds a lot like the “soft zones” it built into the 1,500 MPa Civic rear frame rails on the four-door Civic so they deform predictably during a crash. Those rails can’t be repaired or sectioned by a body shop; as of this writing, they’re replace-only. Honda also wrote Friday that the Accord also has a “crash stroke front frame” but didn’t elaborate. This could be a reference to the kind of collision engineering it built into the 2016 Civic. 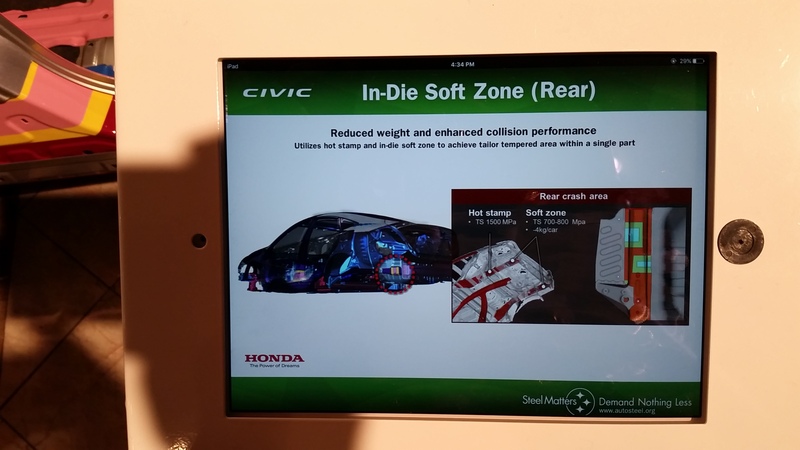 Civic body designer Shawn Crichley said during Great Designs in Steel 2016 that the Civic has small brackets on the subframe, seen in the following video (which also uses the term “crash stroke”). These pull the subframe down and bend it strategically to absorb more frontal-collision energy. 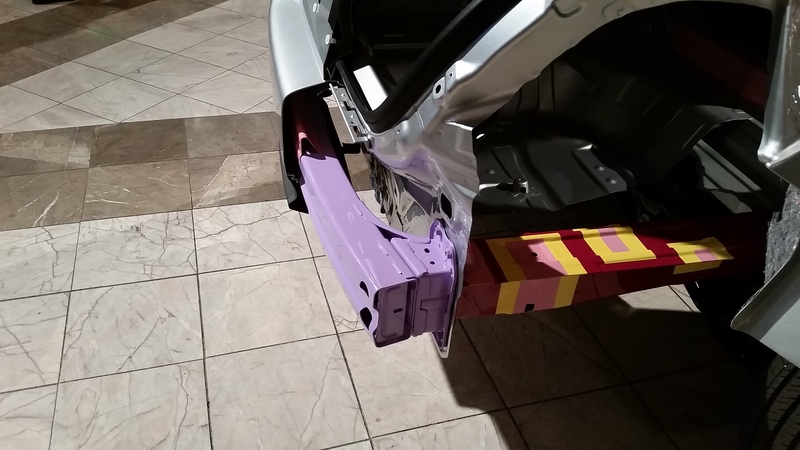 The next-generation Honda Civic sports aluminum front and rear bumper beams. Honda didn’t indicate Friday if any of those parts would be aluminum on the 2018 Accord, but the car was designed upon the same Advanced Compatibility Engineering body structure. Shops working on aluminum elements of predominantly steel Honda vehicles would still need the same dedicated tools and space they would on a predominantly aluminum F-150, according to Honda. • The car has “full underbody covers, which also aid aerodynamics, front and rear fender and engine compartment insulators” for a quieter ride. 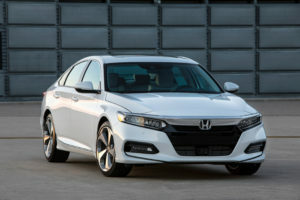 • The car has a three-mic “Active Noise Control system” which is new to the Accord. Essentially, look for microphones in the ceiling. 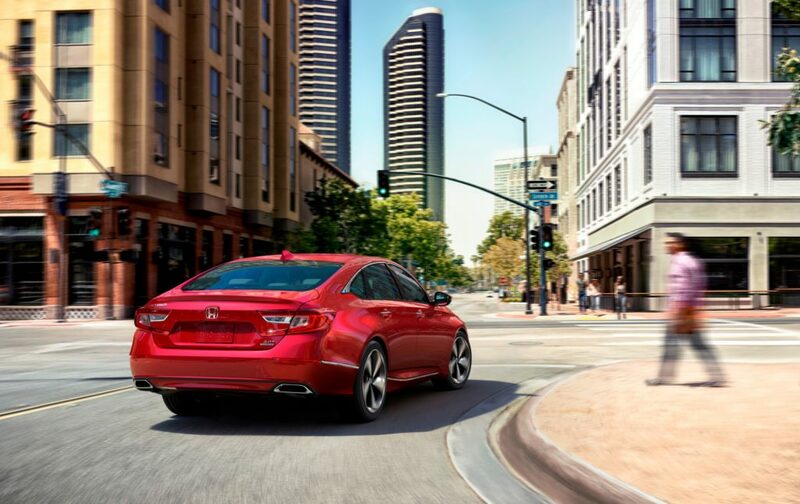 • All 2018 Accords will pack in Honda Sensing standard. Features like autobraking could cut into collision repairer volume, but scanning and calibration are going to be even more important than ever on the Accords you do see. The car has autobraking, adaptive cruise control — which will also work at low speeds – lane departure warning, road departure mitigation and even traffic sign recognition standard, and other advanced driver assistance systems are available as options. Correction: An earlier version of this article incorrectly described the substrate of the 2016 Honda Civic’s hood. The hood is made out of steel. The article has since been corrected to reflect this.